This is just a little tip for those who use python and work with COM automation components. 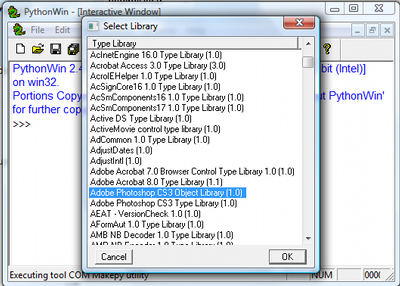 If you are a windows user, and you want to write python scripts to interact with Adobe Photoshop, Microsoft Excel, Microsoft Visual Studio the best way to do so is using the this application's COM componts. But most of the times finding documentation this COM components registered in your Windows is tricky and difficult. 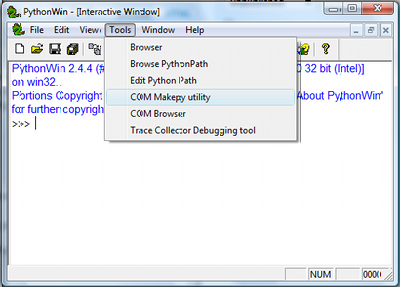 Using a simple tool that is automatically installed with the pythonwin module, you can get wrap python classes for all interfaces and constants exported by a registered COM component. This usually helps a lot to find non documented methods, and even to make your python script more legible and clean. 2. Menu Tools->COM MakePy utility->Explore and select the registered COM component you want to use. There is not a big improvement compared with the firs option isn't it?. The great advantage arrives when you use the wrap classes file with any python development environment like Eclipse+Pydev. During the development of your script you can use the Outline tool over the adobePhotoshop.py and explore the methods of any of the interfaces, for example the Application class and all its properties. 1. Usually for each interface there is a wrap class with the same name, this is an empty class that is usually implemented in a class with the same name but started with underscore. For exampler, to explore the methods of the Application interface look for the implementationt in the class _Application. 2. To explore all data members of one interface explore the implementation of the _prop_map_get_ dictionary of the implementation class. For example, to explore the properties of the Application interface, look for the dictionary _prop_map_get_ of the class _Application. You will be wondering why betewen all those classes I know I have to invoke Application to access photoshop COM. Well it´s easy the entry point classes inherits from CoClassBaseClass.